By 2050, 20% of the world’s population will be 60 years old or more. Under this scenario, diseases related to aging will represent an overwhelming public health issue with drastic socio-economic implications. Thus, we are at a critical point to define interventions that can prevent or attenuate the degeneration that inevitably occurs as we age. Enoxacin is a broad-spectrum fluoroquinolone antibacterial agent and has been used to treat human urinary infections. 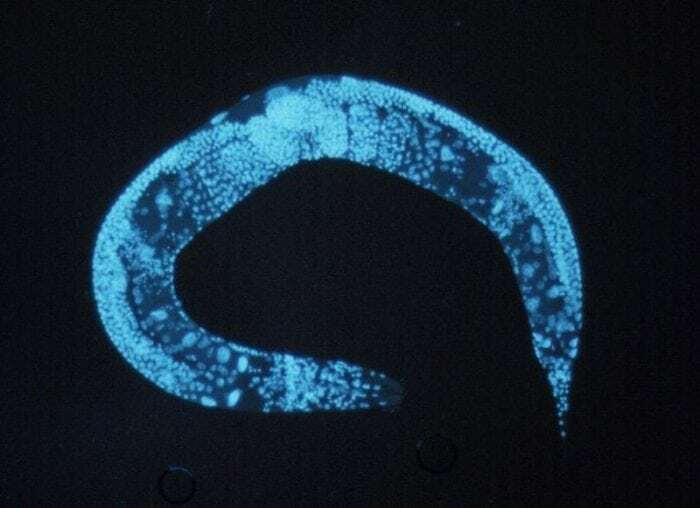 A recent study published in Redox Biology by scientists from the University of Campinas and the Federal University of São Paulo tested the effect of the drug in the lifespan of Caenorhabditis elegans, a worm frequently used as a model organism in aging research. On enoxacin, the animals had an 18% increase in median survival time. Worms treated with the drug also moved better, coped better with stress, and were healthier for a longer time. The study found that enoxacin increases lifespan by reducing the levels of the miR-34 microRNA. MicroRNAs are a class of small RNAs that do not code for proteins and are found in the genome of many organisms, including animals and plants. Instead, these small strings of genetic material regulate the expression of many genes in the cell. Interestingly, the authors found that the drug-induced reduction of miR-34 triggered a low-grade stress response in the animals, and this very stress seems to be the cause of the lifespan extension observed in the worms. This process is called mitohormesis, and, counter-intuitively, it means that some stress can actually be good for the organism. Specifically, the presence of a non-lethal level of oxidative stress leads to the activation of stress-protective genes, which in turn have beneficial health effects. When the worms were treated with an antioxidant, the beneficial effect on longevity was abolished. This study provides proof-of-concept that fluoroquinolones can be developed into a new class of anti-aging drugs. However, long-term use of antibiotics can have negative consequences, such as the development of resistant bacteria. This is why Marcelo A. Mori and his laboratory are now working on developing enoxacin-like drugs that preserve the longevity-extending effects, without the antibacterial properties. According to them, it will be also interesting to see whether this class of molecules can prolong the life of mammals, including humans. These findings are described in the article entitled Enoxacin extends lifespan of C. elegans by inhibiting miR-34-5p and promoting mitohormesis, recently published in the journal Redox Biology. This work was conducted by Silas Pinto, Evandro A. De-Souza , Henrique Camara, Ana Paula F. Pinca , and Marcelo A. Mori from the Federal University of São Paulo (UNIFESP) and University of Campinas (UNICAMP), Vitor N. Sato, Rafael C. Ferraz, Diego R. Mazzotti, and Martin Wurtele from the Federal University of São Paulo (UNIFESP), Michael T. Lovci, Guilherme Tonon, and Katlin B. Massirer from the University of Campinas (UNICAMP), and Camila M. Lopes-Ramos and Raphael B. Parmigiani from the Hospital Sírio-Libanês. Sarah Azoubel Lima is a researcher affiliated with UC San Diego. She has been using C. elegans to study how poly(A) tails can play a role in regulating gene expression. She also does some work on the mechanisms of regulation of the let-7 miRNA and on improving CRISPR/Cas9 genome editing in worms.